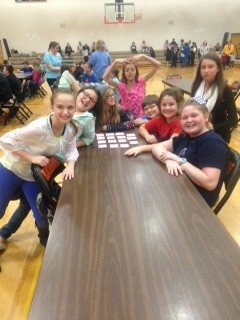 Twelve 6th graders participated in the Name that Book Contest sponsored by the LP County Public Library. One team made it to the final round. They finished in 6th place out of 19 teams. The students had to read 15 different books. 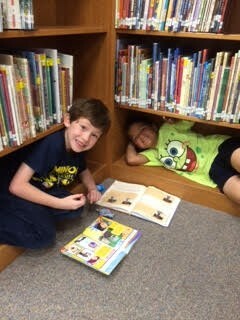 Fifty-one K- 3rd grade students and twenty 4th-6th grade students participated in Night at the Library. The students enjoyed games, a movie and popcorn, and of course reading books! 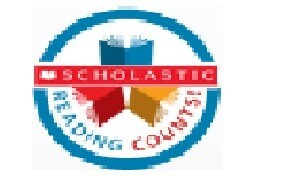 Our students are being challenged to improve the Reading Success Rate of 66.1% from the first nine weeks to 70%. Mr. Anderson was given a list of "things he could do" from the 5th and 6th grade classes. What are his options?--- Kiss a pig, get taped to the wall OR wear a dress!! Hopefully the scores will go up and we will get to see something happen. This year our research has started with a Google Doc the students can use for websites that are useful and reliable. All students are working towards looking for information that is credible and useful to them, rather than just "googling". Each student chose a person to read about and research. They used a general website, online reference source and an SC database listed on their Google Doc. At the end they took a Reading Counts test over their book. This link is a sample of a google doc that has been created for the students to use. The health classes produced a commercial, advertisement or brochure for a health club after investigating the 4 elements of fitness. Freshmen classes discussed banned books. They presented their banned books in a power point and focused on creating a works cited, in-text citations, and picture citations. The students chose one or more mythological characters and shared their stories with a PowerPoint or Prezi. Extra credit was given to students who put their character(s) into a modern day story. The students are developing an understanding of having/owning a business. Our goal is to begin working on a business that will serve SC. Before beginning the research on a dystopia, the Senior students went to PNC and were given a tour of their campus. They also went on a "scavenger hunt' in the library to find print material and were given a mini lecture on evaluating sources using the "CRAAP" method. Each class level researched a tradition of Oktoberfest and presented them to the class. The focus in the library with the 3rd grade class was to work on creating a bibliography for a print source and web source they used in their research. They all displayed a diorama of their Indian tribe in the library. All South Central Students and Staff have had the opportunity to look at and explore our new OPAC. The 5-12 grade students have been issued a Libraries 360 card. The "big red box" the books come in on Monday afternoon is greeted with excitement. 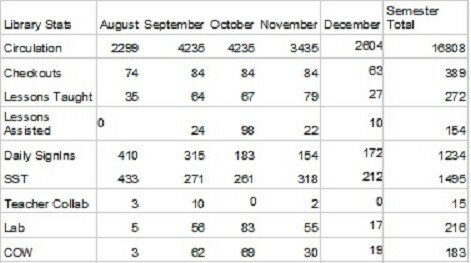 As of October 2015, we have had over 500 books come from the public library to our school. A presentation of the Libraries 360 collaboration was done in Indianapolis at the Indiana Library Federation Conference. 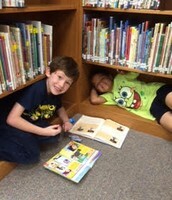 The mission of the South Central Library Media Center is to ensure that students and staff are users of ideas and information, promote reading, integrate technology and foster collaboration.